World champion Lewis Hamilton signed off the first week of pre-season testing with an imposing fastest time. 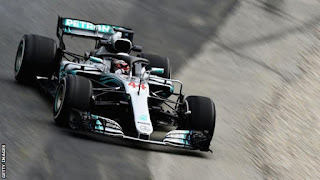 The Mercedes driver was 0.5 seconds clear of the rest and 0.9s quicker than 2017 title rival, Ferrari's Sebastian Vettel, despite using a harder tyre. Pre-season times are notoriously unreliable indicators of form because car specifications are not revealed and many factors can affect performance. But Hamilton's pace underlines Mercedes' pre-season favourites status. After three days of unusually cold weather, the teams finally managed some effective running in warmer conditions on Thursday. McLaren took advantage of the opportunity to finally manage a serious amount of laps after reliability problems affected them on the first two days. McLaren driver Stoffel Vandoorne, who did more than 100 laps before handing over to team-mate Fernando Alonso early in the afternoon, was second fastest, 0.521secs off Hamilton. But the Belgian was the only driver to use the fastest hyper-soft tyre, which is four grades softer - and in the region of at least two seconds faster - than the medium the Briton used to set his time. Alonso was fifth fastest, 1.6secs slower than Hamilton, using the super-soft tyre.